This is the most basic rule of firearm safety. Never allow a gun to point toward people or anything you do not intend to shoot. Whether you are loading or unloading, carrying or cleaning, inspecting a scope or dry firing, no injuries or damage can occur if the gun is pointed in a safe direction. The safe direction may be up, down or to one side—and may change frequently—depending on the situation. Remain vigilant at all times. Always treat guns as if they’re loaded and never touch the trigger until you’re ready to fire. Do not rely on a gun’s safety to prevent it from firing and do not handle a gun carelessly simply because the safety is on. A safety is a mechanical device that could malfunction, so consider it merely a supplement to safe gun handling. Until you’re ready to shoot, rest your finger on the trigger guard or along the side of the gun. Firearms should only be loaded when you are ready to shoot, whether you’re in the field or at the shooting range. Once it’s loaded, don’t lean a gun against anything, as it could fall with enough force to discharge. Also never cross a fence, climb a tree, get into a blind or perform any physically awkward action with a loaded gun. Unload your gun as soon as you are finished shooting. Keep your gun’s action open when not in use. 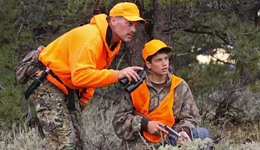 Along with these fundamentals, safe hunters have many other considerations. Make sure of your target and what is beyond. Know basic operation and safe handling characteristics of a firearm before you pick it up, or get help from someone who does. Ensure all guns around you are unloaded and safe. Properly maintain and clean firearms. Use correct ammunition. Wear appropriate eye and ear protection. Store guns securely. And always use common sense. Hunters should never drink alcohol or use over-the-counter, prescription or other drugs before or during the hunt. Budweiser has been the official beer of RMEF for over 23 years. Since 1999, the “Help Budweiser Conserve the Outdoors” program, along with the National Fish and Wildlife Foundation and RMEF members, has raised more than $1.1 million for conservation and education.